Theory and Applications of Image Registration offers comprehensive coverage of feature-based image registration methods. It provides in-depth exploration of an array of fundamental issues, including image orientation detection, similarity measures, feature extraction methods, and elastic transformation functions. Also covered are robust parameter estimation, validation methods, multi-temporal and multi-modality image registration, methods for determining the orientation of an image, methods for identifying locally unique neighborhoods in an image, methods for detecting lines in an image, methods for finding corresponding points and corresponding lines in images, registration of video images to create panoramas, and much more. 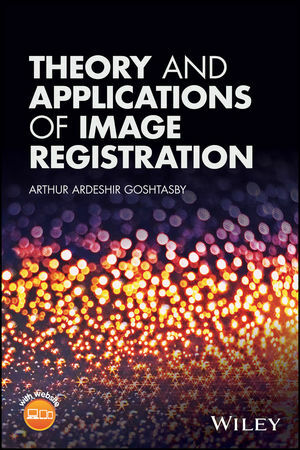 Theory and Applications of Image Registration is a valuable resource for researchers and professionals working in industry and government agencies where image registration techniques are routinely employed. It is also an excellent supplementary text for graduate students in computer science, electrical engineering, software engineering, and medical physics. Arthur Ardeshir Goshtasby, PhD, is a professor in the Department of Computer Science and Engineering at Wright State University. Dr. Goshtasby has more than thirty years of experience in the areas of computer vision and pattern recognition and has published more than sixty journal articles and seven book chapters, addressing issues in image registration. He is the author of 2-D and 3-D Image Registration (Wiley, 2005).